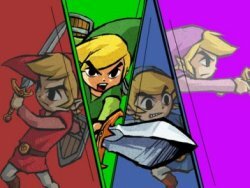 Four Swords DSi: Visions of The Future? IGN recently posted about The Legend of Zelda: Four Swords that was announced at E3 as a free download to the DSi. They speculated if this means that more Gameboy Advance games will be coming to the Nintendo 3DS eShop’s Virtual Console. They specifically mentioned the possibility of A Link to the Past, which released on the GBA with updated graphics. That cartridge is where Four Swords first appeared. Read my thoughts on what this might mean after the jump! Obviously this brings Minish Cap to mind, but what about the Four Swords Gamecube sequel, Four Swords Adventures? That game was available for one to four players on the Gamecube but required Gameboy Advances linked to the Gamecube for more than one player. Which if you’ve ever tried to play that game with friends, was like one of those “frustrating scenario’s” you see in infomercials! The first “freebie” on the 3DS eShop was Excitebike 3D, an NES game specifically modified for the 3D capabilities of the new handheld. Nintendo said with the introduction of Excitebike 3D that they would be releasing other games into their new category “3D Classics.” Ocarina of Time 3D and Star Fox 64 3D are obviously rare exceptions of full remakes. 3D Classics of old 8-bit games are great, but I say, why stop there? Why not offer SNES, N64 and GameCube games for download? Or even the possibility of the 3DS Virtual Console bringing over the entire library that the Wii Virtual Console already has? Imagine the possibility of having every Zelda title available in the palm of your hands! Even the GameCube games like Twilight Princess! Nintendo just dropped the price of the Wii version of Twilight Princess to $20 here in the States, I’d pay to have it on my 3DS! Let me know if you want the eShop library to explode like I do.